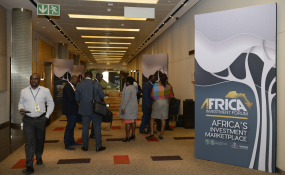 This week's inaugural Africa Investment Conference is expected to be a game-changer for the development and economic growth prospects of the continent, organisers said on Monday. The three-day forum, which will kick off on Wednesday, will see government leaders and captains of industry gather at the Sandton Convention Centre to chart a new growth path for the continent. The forum is organised by the Gauteng Provincial Government and the African Development Bank Group (AfDB). The forum comes hot on the heels of South Africa's first Investment Conference last month that saw businesses pledge to invest billions of dollars into the South African economy. "The Africa Investment Forum is a game-changer," said Victor Oladokun, AfDB director of communications and external relations during a press briefing. "This is an unprecedented investment forum all of Africa has never seen." The forum, he said, would be less talk and more tangible progress. "This forum is about working together as one, forming alliances, collaborations in a way never taken place before on the African continent. It's not gap-fest, it's a talk shop. In actual fact, talk will be limited. As we all know, talk is cheap. What we are interested in is transactions, transactions, transactions and deals," he said. About 28 boardroom sessions will deliberate on 61 bankable projects worth $40 billion across the continent. "We are excited about the opportunity and platform that we have together," said Oladokun. He said Africa needed to challenge itself and bust myths about the continent being an investment risk. "Some are more myth than reality but to defray these perceptions and to encourage investment on the continent, we are providing a number of de-risking instruments that will support investors coming in. "What we are saying is that as far as economic transformation is concerned, it has to be business unusual. We cannot continue to do things same old, same old, and expect different results. The bottom-line is that South Africa and the rest of the continent needs to be the favourite destination for investment conferences and financial conferences. "At the end of the day, we do a whole lot of talking and that's about it. That time is over; that has to change. This is the beginning of a new conversation and way of doing business moving forward," he said. Forum steering committee chairperson and Gauteng government executive, Mduduzi Mbada, expressed delight to see the conference coming to life a year after it was conceived. "As the Gauteng government, we are delighted to be the hosts and planners of this forum, the biggest first of its kind investment market on the continent. I have no doubt that this forum will be a success," he said. Hosting the Africa Investment Forum is one of Gauteng's pillars in the programme for transformation, modernisation and reindustrialisation. "Gauteng has strong credentials, and is a proponent of intra-Africa trade and investment, as well as regional integration. Gauteng based companies are significant investors in the continent and the provincial government is working with key leaders to assist Gauteng firms in assessing major value and supply chains on the continent," Mbada said. The province, he said, is strengthening relations with key economies in the Southern Africa Development Community region and the rest of the continent. "We are off the firm view that the best for our continent still lies ahead. Africa's economy is capable of delivering sustainable, decent and reliable return for investment. Africa has entered a new and exciting era of growth and development, hence we believe in this partnership," he said. Mbada said the ultimate goal was to see better standards of living for the poor on the continent. The Gauteng government aims to use the forum to once again position the country, the continent and province as the destination of choice for investors. "We'll showcase our world class infrastructure, sound and investor friendly regulatory environment. We will draw investors' attention to what we are doing to reduce red tape, eliminate bureaucracy and inefficiencies in government. "Our primary message is that Gauteng is open for business. We are a springboard to the rest of the continent. Gauteng is where Africa's business starts," he said.